Increasing sectarian conflict in Syria has affected Lebanon in several ways. Hundreds of thousands of Syrians have fled over the border into Lebanon as a direct result of the violence in Syria. 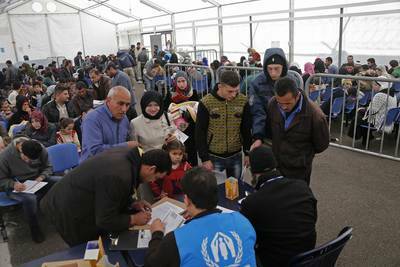 The number of refugees registered with UNHCR in Lebanon increased drastically, from more than 130,000 in January 2013 to around 900,000 in March 2014, the largest refugee population from Syria in the region. In addition to refugees registered with the UNHCR, many refugees have not registered or are Syrian migrant workers in Lebanon who cannot return to Syria. According to the most recent estimate by the Lebanese government in March 2013, one million Syrians, including Syrian workers and those that have not registered, were living in Lebanon. Fleeing the continuing violence at home, Syrian refugees risk persecution by the Lebanese security services, and even their lives, when they cross the border into Lebanon. Syrian defectors and dissidents who fled their country were allegedly arrested by the Lebanese army and sent back to Syria. The enormous influx of Syrian refugees into Lebanon has had many destabilizing consequences for Lebanon. The total cost of the crisis to Lebanon is projected to reach 7.5 billion USD by the end of 2014. Spending on education and health has increased dramatically. Competition on the job market has driven wages down, while prices for basic necessities have increased. The majority of refugees are living in the poorest regions of Lebanon, such as the north and Beqaa, and this has led to increasing friction with the Lebanese population. The increased demand has led to water and electricity shortages, pressure on waste management, and overcrowded public schools. Areas near the Lebanese-Syrian border have been subject to cross-border fire, incursions, abductions, and arms trafficking. For the first time, on 18 March 2013, the Syrian regime launched airstrikes on Arsal, in eastern Lebanon, targeting suspected Syrian rebel positions. From the start of the Syrian crisis, the Lebanese government sought to prevent the violence from spilling over into Lebanon. In an interview with the UAE-based daily The National in January 2012, former prime minister Najib Mikati stressed that his country does not want to become involved in Syria’s domestic affairs. Critics have, however, termed the government’s self-proclaimed neutral position as tacit support for the Syrian regime, because Lebanon abstained from voting on a suspension of Syria’s membership and enforcement of economic sanctions during an emergency session of the Arab League on 12 November 2011. In addition, on 22 January 2012, Lebanon was the only member of the League to refrain from calling on al-Assad to step down. It had earlier (on 3 August 2011) disassociated itself from a United Nations Security Council statement condemning the Syrian authorities for ‘widespread violations of human rights [and] the use of force against civilians’ (in 2010/2011 Lebanon was a non-permanent member of the UN Security Council). In February 2012, Lebanon abstained from voting for a UN resolution condemning the Syrian regime and supporting a plan calling for Assad’s removal from power. Furthermore, Lebanon abstained from the UN resolutions of 3 August 2012 (calling for a political transition), 15 May 2013 (condemning the government’s indiscriminate violence against civilians) and 19 November 2013 (condemning human-rights violations). Lebanon’s stance can be ascribed to the dominant position of Hezbollah in Lebanese politics. Since the second half of the 1980s, the organization has maintained a tactical alliance with the Syrian regime. Syria is a crucial channel for military aid from Iran and a vital ally in an informal alliance—the so-called Resistance Axis (Jabhat al-Mumanaa), which also includes Iran and Hamas—against the alleged American-Israeli hegemony in the region. Hezbollah’s support for the Syrian regime has not been limited to rhetoric; Hezbollah fighters from Lebanon have been fighting against Syrian rebels, primarily in al-Qusayr and surrounding Shiite villages near the border with Lebanon. 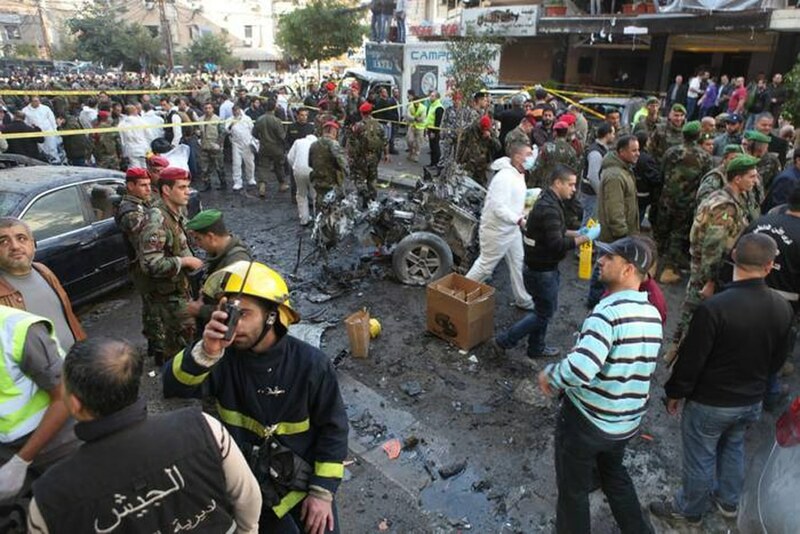 This military involvement has increasingly led to cross-border shelling and rocket attacks into Lebanon. While Hezbollah initially denied its members were fighting in Syria, Hezbollah leader Hassan Nasrallah on 25 May 2013 officially committed to fight the Syrian opposition. The narrative of Hezbollah is that it helps the legitimate Syrian government in its fight against what it calls “terrorists”, radical Sunni jihadis who, in its eyes, are supported by the United States and Israel. In addition, Hezbollah claims that these jihadis supported by external powers threaten not only Lebanon’s Shia but all sects. In this way, Hezbollah tries to win domestic support. While Hezbollah retains support within Lebanon’s Shiite community, its role in defending the Assad regime has raised criticism from within. Hezbollah has been losing popularity, as some fighters have refused to fight in Syria. By siding with the Assad regime and its Alawite supporters, Hezbollah has involved itself in a conflict that has nothing to do with the aim for which it was originally established, resistance to the Israeli occupation. Its involvement in the Syrian conflict is not surprising, however, given that Hezbollah, as part of the Axis of Resistance, is defending its essential supply lines in Syria.